buynow/bloglater: #B1turns10 and a make up question! #B1turns10 and a make up question! I think this may be my new favourite OOTD location. Not only is there nobody around to throw quizzal glances at you whilst you prance around but the light is perfect. Expect to see it many more times! To kick off the weekend I thought I would wear my new Zoe Karssen tee and some sloppy jeans. I feel like Zoe Karssen is grown up Wildfox. It's not quite so cutesy but still appeals to the part of you that likes those quirky printed statement clothes. Tee: Koe Karssen - Link! 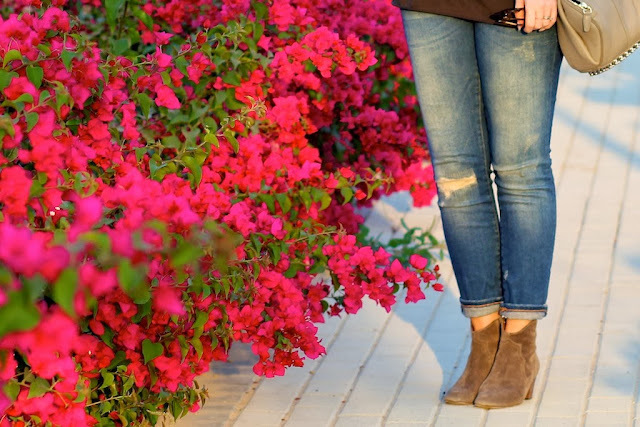 Boots: Isabel Marant - Link! My hair is currently mourning the loss of Oribe Texturising spray. We are still in that phase where we cannot quite believe the can is done and so spray air into our roots. * Charlotte Tilbury something....although not sure what exactly. The jacket looks great and the top looks really cozy! Same here about Charlotte Tilbury. I know I want something but don't know what! The lipsticks looks specially luxurious... But so do the blushes, and the eyeshadow palettes. Aaaaaaah decisions!!! P.S. You look absolutely stunning here, this hair suits you incredibly well. Check out my comment below, I've put in my recommendations for the Tilbury line. Personally, I'm a Nars girl when it comes to blush, so I wasn't too keen on the Tilbury ones at the counter. Love this casual look & the shoot location is perfect! I love this outfit. This is such a beautiful location for photos too! The bag looks great in that colour! A nice change from the usual black. Wow the lighting really is perfect! I love your "sloppy" jeans and that tee. I have been wanting a Zoe Karssen top since the "Creme de la Creme" sweatshirt! I wish we had such warm weather in London. Fantastic looking forward to my Ciate advent calender too! I like your style. The blue jeans looks great. I think you should buy a hermes birkin bag to fit this style. I know a website http://www.macybags.com which have huge selection of hermes bags. Check out the website if you interest in it. Have you tried the bumble and bumble dryspun? I've got dead thick hair and it manages to give me some airy lift - love it! I absolutely LOVE the t-shirt! Gorgeous photos! My must haves are the Mascara (I ended up asking for a friend to bring me back up stock), Lipsticks (I love the shades Marilyn and Love Bite), Lip Pencils, Liquid Liner and Kohl Pencils (i wore this combo to Sandance for 12 hours last weekend and it did not budge!) and the eye shadow pencils (in shades amber haze, which is an antiqued gold and black pearl, a shiny mauvey taupey color). The nice to haves are the eye shadow quads, but I found that most shades have dupes and the fine gold highlighter. The fine gold highlighter is why I went to the counter in the first place, but after using it I find that it is a beautiful product (It makes you look like there is a real dewy glow on your face) but its not really wearable, often people ask what product you are wearing cause its so shiny! But it is awesome for evenings in dimly lit restaurants and bars. I have one regret though, and that is not buying the magic cream :( Hope this helps you decide!